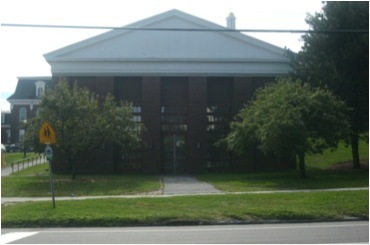 The building attached to Ira Allen Chapel, that faces Colchester Avenue, is known as the Campus Center Theatre. Quite literally, it is the building that has been used as a theatre in regards to the complex known as the Billings Ira Allen Campus Center. It is a post-modern, one story, north-facing building with red brick and white wood trim. It has a forward-facing gable roof and the front facade is framed with square columns and has an in-antis entrance topped with a large pediment. The front facade is completely symmetrical; the building has been considered colonial revival because of the way it utilizes classical characteristics in a modern way. The building was added to the Ira Allen Chapel in 1986 as a part of the creation of the Billings Ira Allen Campus Center; additions were made by Shepley, Bulfinch, Richardson and Abbott, a firm that worked in cooperation with the Preservation Partnership. (1) The building does not attempt to recreate either Ira Allen or Billings, but rather utilize "motifs" from both to "provide unity to the entire complex". (2) The building was designed as a lecture hall and has been utilized for hosting lecturers, university events, politically oriented gatherings, and dramatic productions. The Campus Center Theatre was recently constructed compared to other buildings around the University of Vermont Green, but in the few decades it has been around it has functioned as a hub for student political activity. Its connection with the Ira Allen Chapel and Billings Library has given it a vital connectivity to student life, development, and initiative. Although it is still young, its character as an environment to inspire activism and involvement has and continues to develop in a way that makes it a contributing resource to the University of Vermont student body and surrounding community. (1)In celebration of the centennial year of the Billings Library and the diamond jubilee of the Ira Allen Chapel: dedication ceremonies of the Billings-Ira Allen Campus Center, (Burlington, VT : Queen City Printers, 1986), pamphlet with no page numbers. (2)In celebration of the centennial year of the Billings Library and the diamond jubilee of the Ira Allen Chapel: dedication ceremonies of the Billings-Ira Allen Campus Center, (Burlington, VT : Queen City Printers, 1986), pamphlet with no page numbers. (3)Nancy Bazilchuk, “Students Debate Bombing” Burlington Free Press, April 14, 1999. (4)The Student Political Awareness and Responsibility Coalition, SPARC. http://www.uvm.edu/sparc/pastevents.html. (accessed October 28, 2011). (5)Lynda Majarian, “V-day Visits UVM” The University of Vermont, February 13, 2002. http://www.uvm.edu/~uvmpr/?Page=article.php&id=286 (accessed October 28, 2011). (6)The University of Vermont, The Rubenstein School of Environment and Natural Resources: In conjunction with The Gund Institute for Ecological Economics, “Spring 2006 Seminars”, http://www.uvm.edu/giee/beyondenvironmentalism/Costanza/SeminarPoster.pdf (accessed October 28, 2011).